Septic systems can last for a few decades if they are installed, maintained, and treated properly. By depleting the BIO-mat and keeping systems’ soil pores open, it’s possible to keep them running for a very long time. However, issues arise when debris, grease, and hair build up in drains. You might not even notice that damage is occurring until your system breaks down. That’s why it’s important to get your septic system checked or maintained at least once a year. Drains can become clogged whenever they are exposed to foreign objects. Damage can occur instantaneously or over time, depending on whether an object automatically gets stuck in the drain or if it clogs a part of the drain and forms build-up. Sewer lines reach from a house to the first septic system component. All lines inside the septic system, along with other water lines on properties, can often get clogged with tree roots, leaves, and roof debris. 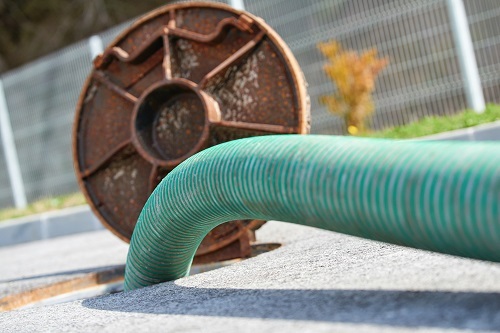 This can significantly block up your septic system. Clogged drains not only cause these pesky problems, but they can shorten the lifespan of your drainage system. This is why it is important to be proactive about keeping your system in tip-top condition with yearly sewer and drain cleaning. Although household chemicals might temporarily help offset immediate drainage problems, they do not effectively clean drains for the long term. Over the years, grease, hair, debris, and sediment cause drains not to work optimally. Garbage disposals, while they seemingly help decrease the amount of items that clog the systems, actually cause drain cleaning to be needed more frequently. The only way to ensure that your drain will remain clear for an extended period of time is to call a company for drain cleaning services. At Delaware Valley Septic, Sewer & Storm, we offer fast and efficient sewer and drain cleaning services. We have been providing drain cleaning and other sewer services in Chester County, Montgomery County, and Gladwyne for over 20 years. We have always come to commercial and residential properties prepared with the equipment and knowledge to meet drain cleaning needs and expectations. Delaware Valley Septic, Sewer & Storm can help solve any septic system issues and unclog your drains and pipes. With an advanced drain cleaning system, we effectively and safely clean the toughest drainage problems in an eco-friendly way. Our jetter is the quietest there is, with soundproofing up to OSHA’s standards. It is also proven to help maintain pipes and keep their longevity. Additionally, our electric pump gives maximum cleaning distance. Our sewer jetting services are always thorough and precise for your convenience. We offer superior sewer jetting and drain cleaning for commercial and residential properties. If you live in or around Montgomery County, Chester County, or Gladwyne and you run into a sudden or gradual drain issue, we can quickly offer sewer and drain cleaning that will get your water flowing again. In addition to sewer cleaning, we offer many other services to improve the quality of your septic system, such as septic system pumping. As soon as you notice a problem with your system, be sure to call us right away for immediate service. If you notice any signs of drain clogging, call Delaware Valley Septic, Sewer & Storm at 1-(844)-4-DELVAL for quick and professional sewer and drain cleaning.